Heaving to for a cat nap! I’m feeling well rested now and ready to tell you all about our adventures yesterday furiends. We left Ponza and had good favourable winds for our journey back to Rome. Everything was going smoothly until dad realised the engine was overheating. He went down to check it out and saw a little bit of water leaking from the water pump. Since it’s a good place to start with any overheating problem, once the engine had cooled down, I instructed him to take the water pump apart to check and change the impeller. It looked OK but he changed it anyway and made sure all the hoses were tight before reassembling it. We were then able to run the engine with no further problems but I kept a cats eye on it the whole way home to be sure. Shortly afterwards we saw some thunder storms in the distance and we tried to avoid them by tacking and sailing away from them, but the sheer size and speed of them made that impossible. So we reefed the main (to reduce the size of the mainsail) and furled up our massive genoa. Then we set the boat to heave to with a deeply reefed main and the staysail. Heaving to is basically just like parking the boat in the middle of the ocean. The driving action from one sail is approximately balanced by the drive from the other and the boat slows down to almost stop. The difference in the motion of the boat is unbelievable. It meant we could all come down below and take a break. Since there were lightening strikes all around us I made sure the humans turned off all our electronics and put the VHF radio in the oven…just in case! Then I supervised them from the comfort and safety of my travel case wedged into the corner of the sofa, to make sure they didn’t touch anything metallic, especially the mast! Usually these thunder storms pass through quite quickly but yesterday there was just one after the other so we sat hove to for about an hour and a half. Once they’d passed and I was happy it was safe again we set off. As we got closer to Rome we were able to unreef the mainsail and use the genoa again. We flew along at seven knots and laughed at how sick my mum had been! No, I’m only joking, we were very supportive, she was very glamorous whilst she was busy with the bucket! Everyone can get sick, there’s no shame in it. Luckily for me I slept most of the way and didn’t get sick at all yesterday! I do feel quite sick however, when I look at what the humans broke, but I’ll tell you all about that tomorrow. Uh-oh, Bailey, what did your humans do now?! BTW, I’m doing the giveaway for your book today! What a time you had Bailey! I know I would be sick like your mom. I’m not a great adventurer when I’m away from something familiar. A master sailor, we guess that’s why you’re an admiral. A bit ironic putting the VHF in the oven so that it doesn’t get cooked by lightning! Heaving to can lead to a lot of heaving, period! I recall waiting for enough wind to start races where half the crews would be feeding the fish – involuntarily! I think that would be petty scary but you seem to have taken it all in stride. What an adventure. Yow Brfour Bailey all dat heavin n hoe-in iz amazin!!! 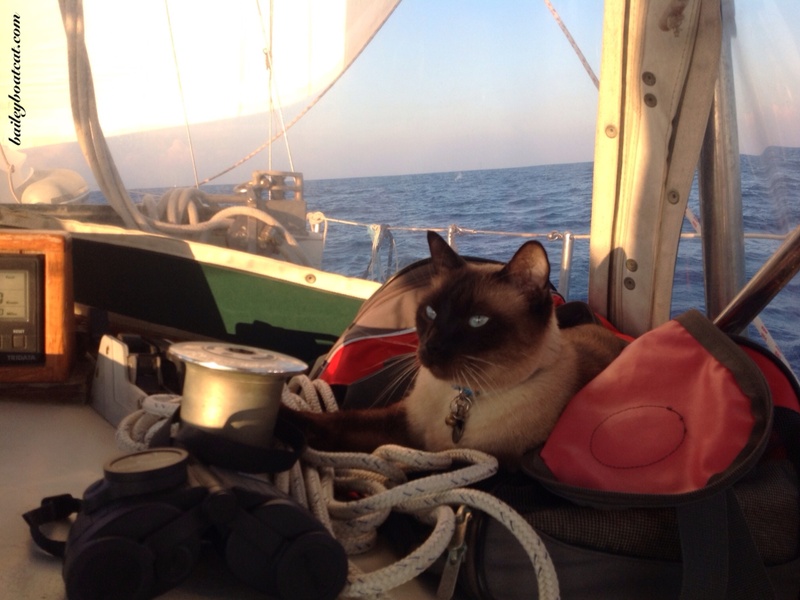 Me waz gettin a bit seasick reedin of yer adventurez…so me can reelatez wif Miss Louise n da buckit! Why did ya putted da VHF radio in da oven?? We iz bery cureeuss me can tell ya…. We did understand how ya stopped da Nocturne in da ocean n rode out da stormz! What an adventure! Seasick! Ugh. That is not fun at all. Have you ever been seasick, B? Wow – how great to hear your drama (although I bet it wasn’t too much fun). You really brought it alive Bailey – thank you. Sailing is so much fun isn’t it. Without these events we wouldn’t have many stories to tell. I’ve never thought about putting the VHF in the oven. What does that do?? Wow, what an adventure, Bailey. We’re glad you made it through those storms. Gettin seasick don’t sound like no fun to me! Storms and lightning…. we really don’t like them on Take It Easy! My goodness, glad you were on top of the situation, Bailey my buddy!! 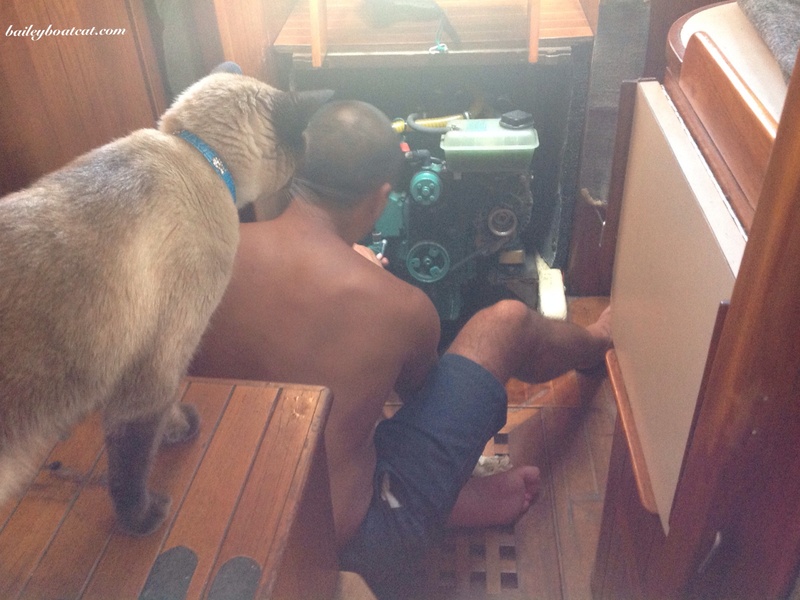 You all are experienced sailors and know exactly what to do when there’s any kind of weather problem….AND I’m glad your Dad followed your instructions and got that engine problem fixed quickly too! Sorry your Mum got sick but I’m sure that happens to EVERYONE if it gets rough enough out there on the water. Anxious to hear about what ELSE happened to you all tomorrow!!! My tummy was getting a bit queasy just reading about it, Bailey! Glad to hear you were a terrific snoopervisor; it’s an innate skill carried by every cat that ever lived. Being in the middle of a big storm must have been scary! Poor Mom and her motion sickness! Glad to hear you are all safe. Good thing you were there to make sure you all got back in one piece! !